Double Jacquard Fabric Our premium knit, double jacquard fabric is designed to provide advanced breath ability. Quilted Bamboo Charcoal Memory Foam Our Performance Memory Foam is infused with bamboo charcoal and is quilted into the cover, creating a layer that regulates moisture, odor, and temperature while adapting to your body's individual pressure points. 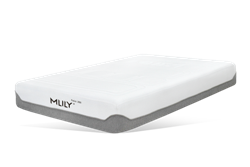 1" Mlily Air-Flow Gel-Memory Layer Our Mlily Cooling Gel is infused into our aerodynamically designed Memory Foam, creating a cooler, breathable sleeping surface that adapts to you. 1.5" Bamboo Charcoal Memory Foam What's	better than one Bamboo Charcoal layer? Two. Our elite Performance Memory Foam is infused to create an added hypoallergenic layer that adapts to you. 1.5" Flex Comfort Foam Our Flex Comfort Foam adds another layer of comfort to create a more supple feel. 2" Pocket Springs We've designed a specially fitted Hybrid Support-spring to provide a complete and thorough foundation. High performance springs line the core of this mattress. 6.3" Aero-Flex Border. Our aerodynamic border is fitted to keep air-flow consistent, helping you stay cooler and get to sleep faster. It's also built with specially molded joints to keep support even, from the center to the very edges of your mattress. Flex Support Foam. We've added a final layer of our custom Flex Support Foam to provide an overtime level of support. 2.5"